Who can resist anything free? Not me—especially when it comes to getting really expensive things for free. 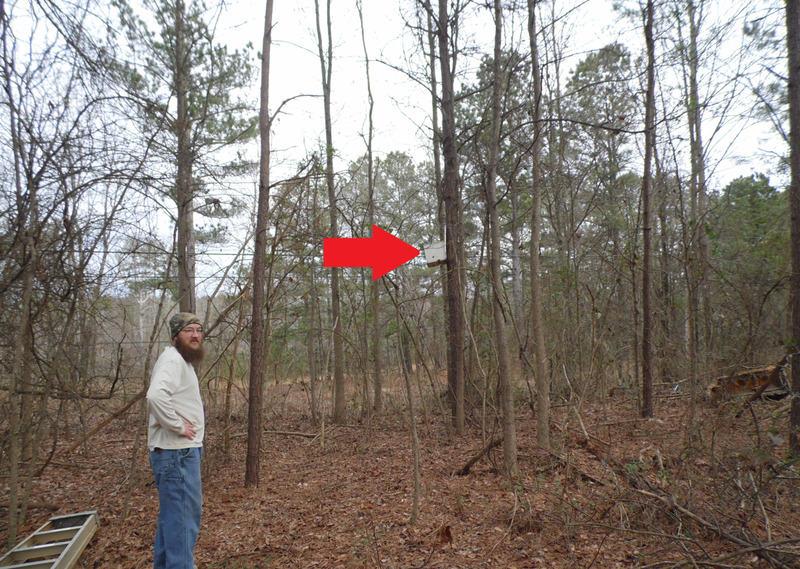 When I first found out about trapping honey bee swarms, I knew I had to get started. 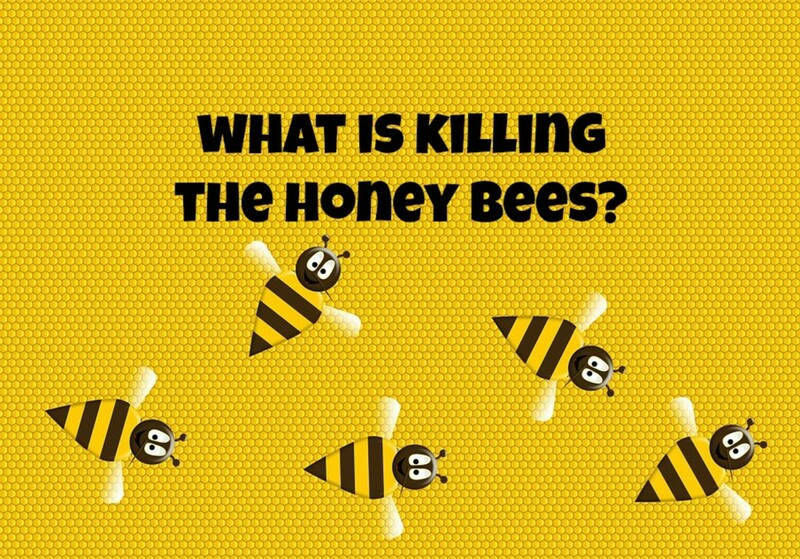 A colony of honey bees is normally sold by farmers for well over $125, and a swarm trap is cheap, so how can you lose? 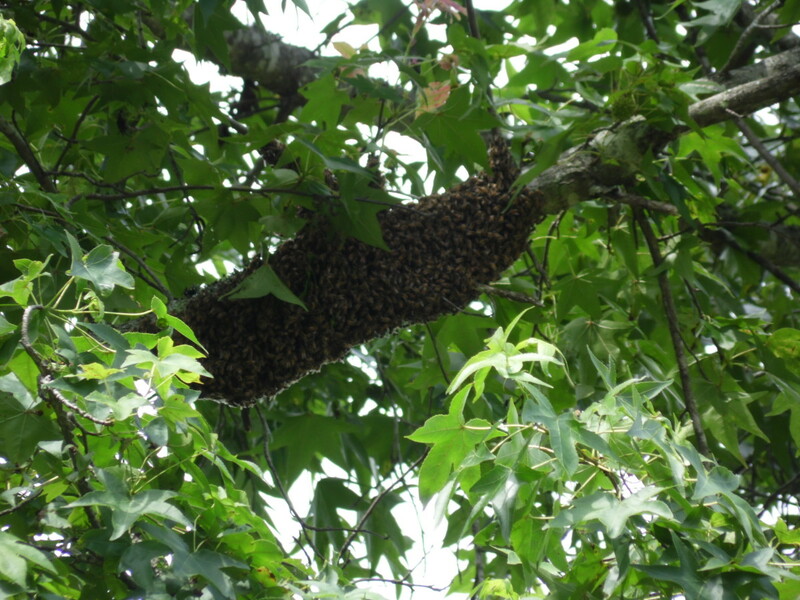 Some beekeepers catch dozens of swarms every year. Sure, many of these swarms may be coming from their own hives. But why lose your precious bees when you can increase your apiary instead? Just keep in mind swarm trapping is a lot like fishing, even under the best circumstances, with the best equipment and bait, you still may not catch a thing! So don't go spend a ton of cash on materials. Use my tips and tricks to catching swarms without spending a lot, and have some fun in the process. There could be a swarm out there with your name on it! Swarm of honey bees high in a poplar tree. It will be very important to figure out when your local swarm season occurs. 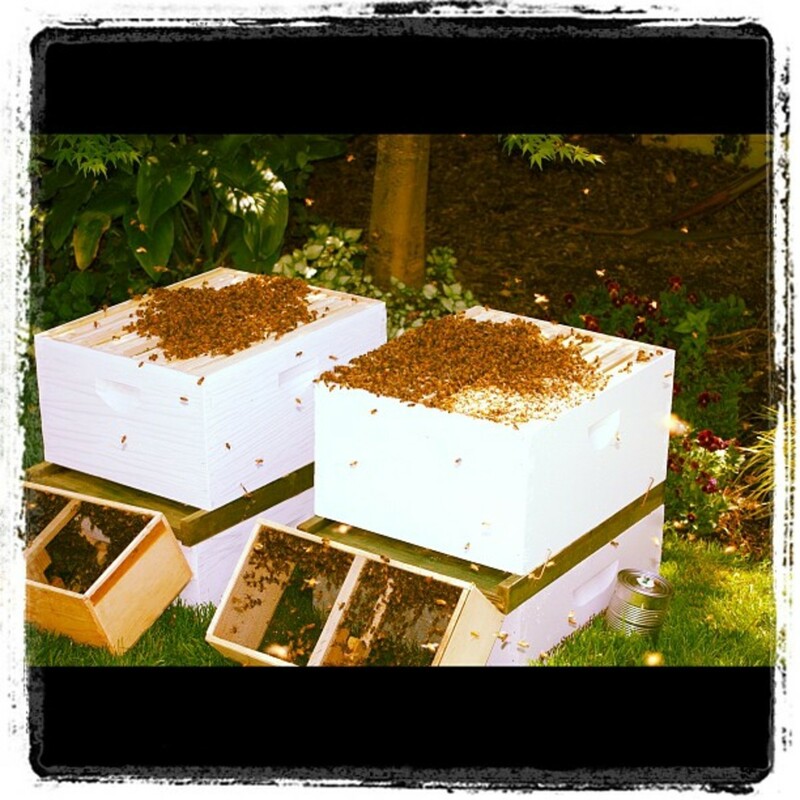 You will want to have your swarm trap up before the swarm season starts. A rough estimate in the United States is to look for dandelions blooming. When the dandelion bloom starts, you better get your traps up quick. You can usually figure swarm season will begin shortly after the last winter frost. So by knowing the average last frost date in your region, you can set up your swarm trap about a month before that date. Swarm trap on hanger in oak. 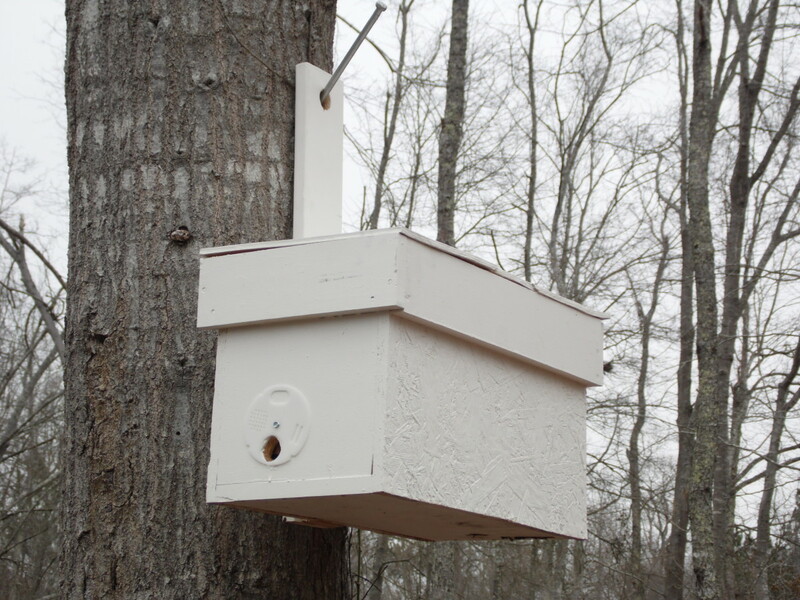 The simplest swarm trap is merely a box with a lid, swarm lure placed inside, and an entrance hole in the box. The lid should be easy to remove,and a couple of handles on the box is very helpful. When a honey bee colony swarms, they send out scout bees. These scout bees search for a nice location to create a new hive. 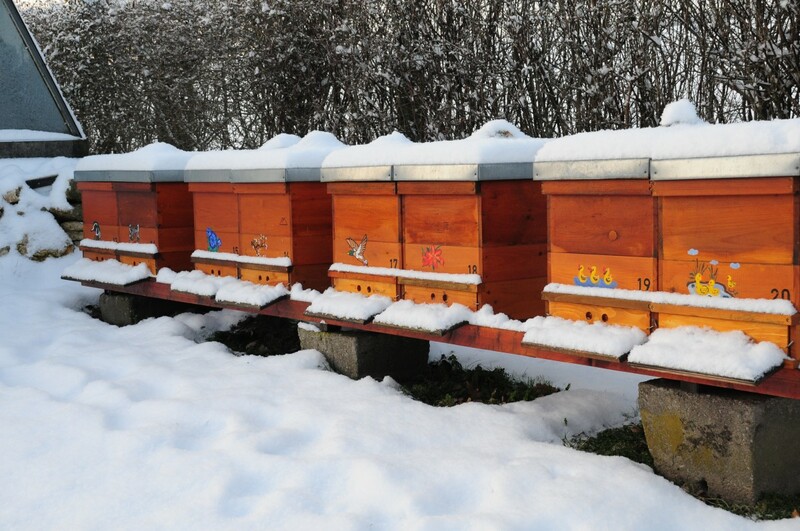 If your box looks good to the scout bees, then you are much more likely to catch a swarm. The size of the box itself does have some impact. A box that is too small will have less chance of attracting a swarm. Make sure your box is at least nine inches tall, twenty inches long, and 10 inches wide. A one inch entrance hole works pretty good. 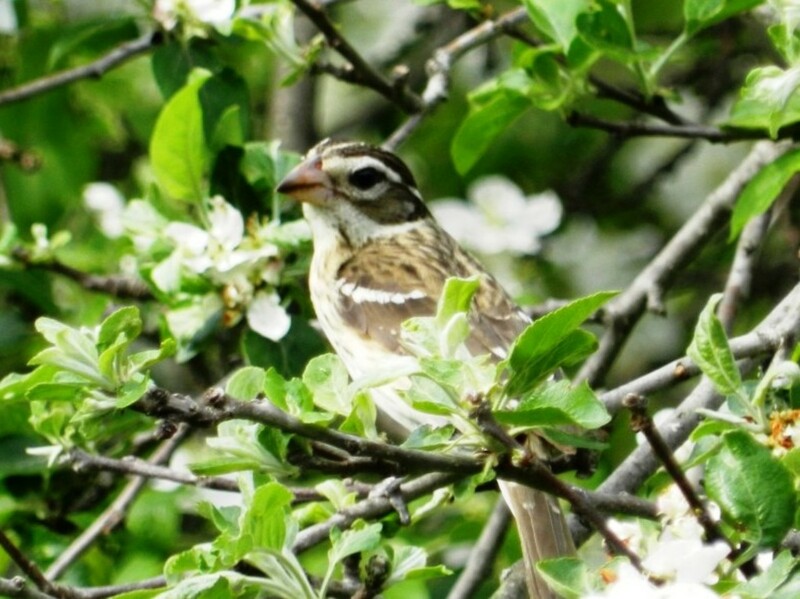 A barrier to keep birds out may be necessary, such as 1/2 inch hardware cloth. A nail tacked into the hole, splitting the hole in half works also. I highly recommend using a box that will hold frames. 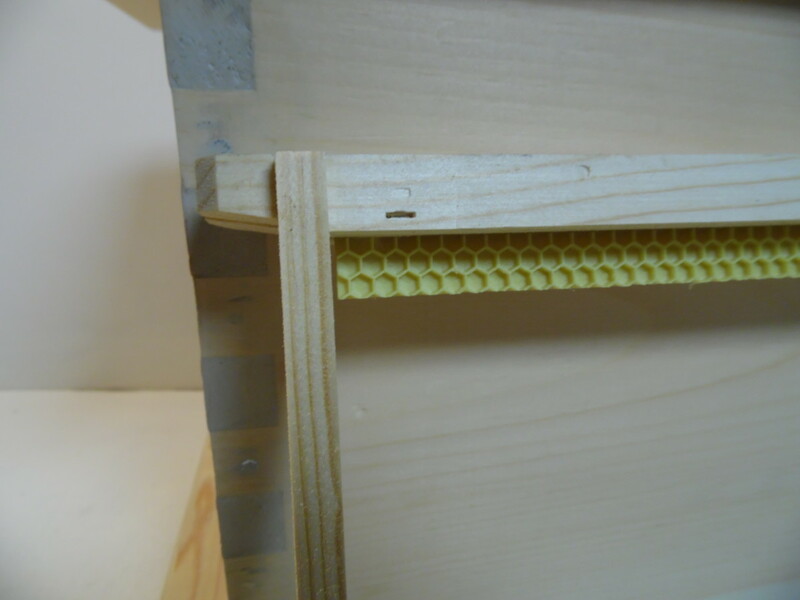 Frames are not a must, but they make it much easier to move a swarm into their permanent hive later. Swarms are geared to make wax, and tend to draw comb quickly. 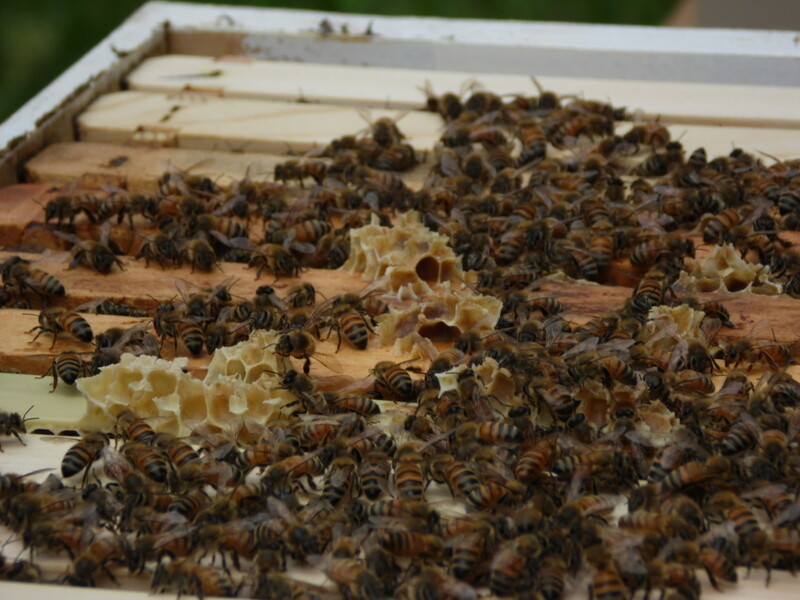 Without frames, they can quickly attach combs to the lid of the swarm trap. When using frames in a swarm trap, do not use foundation. This may make the box appear too small to the scout bees. Frames with starter strips of foundation work great. Wooden frame with starter strip of foundation. 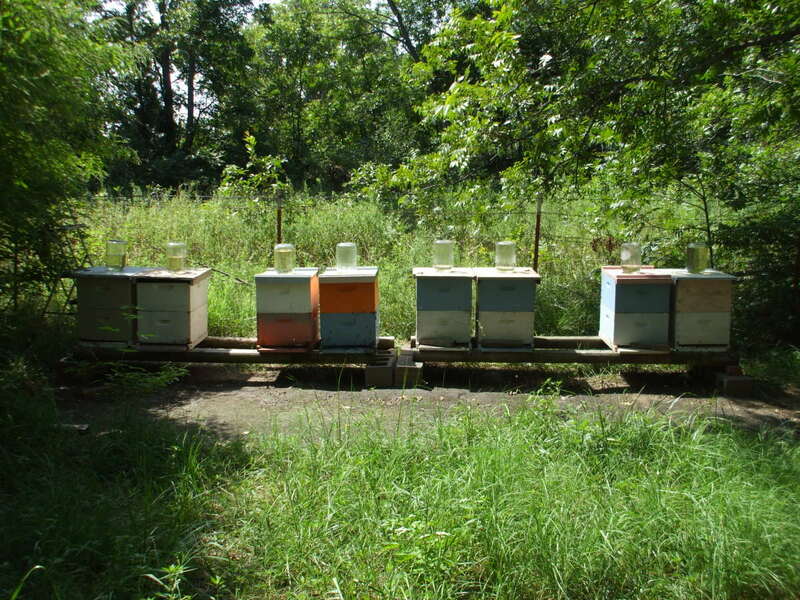 A swarm trap needs a lure, and many beekeepers use lemon grass oil. There are many other methods, but lemon grass oil is tried and true. If you have an old comb, even a part of one, place it in the trap also. Some people report using slum gum, the junk left over after melting wax off an old frame, with good results. To apply lemon grass oil, soak one end of a cotton swab. Dab the entrance with oil, then place the cotton swab inside the trap. I like to place mine near the back of the swarm trap. The trap should be placed ten feet off of the ground, for best results. This is the accepted 'best' height, but any height will work. I have seen photos of honey bee colonies in old tires, laying on the ground. Just stay within your comfort zone. Try to make sure the trap will be easy to remove. If you can't easily move it while empty, it will be much harder when it is full of bees! Small honey bee swarm trap. After you set up the swarm trap, or traps, all there is to do is wait. Check your traps often, and look for bees working at the trap entrance. If you do catch a swarm, wait a couple of days for them to settle into the swarm trap. Place them in the new hive and let them start building. Some folks hive them with a frame of brood, when available. No matter how you choose to hive them, nothing beats a colony of free honey bees! Well folks, I have successfully captured a swarm of honey bees! I had no luck in 2014 with my original traps, so I expanded in 2015. Heading into 2015 swarm season, I had nine swarm traps placed in several locations. Each trap was baited with one frame of old brood comb and lemongrass oil. 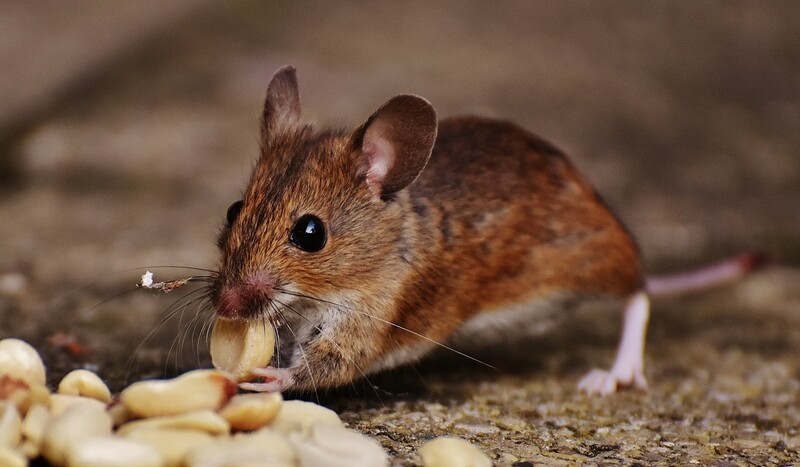 I checked the traps often during the spring and summer, and never caught anything. I had one trap at my fishing camp that was visited by hundreds of honey bees, but still no luck. I went around for the last time at the end of August and checked them all and they were all still empty. So I gave up on trapping for the winter and focused on my hives at home. Jump forward to the end of January 2016, when the time to start spring beekeeping chores was upon us here in West Georgia. I went around to collect up some of my swarm traps, as I had decided to use a few to make splits from my existing hives. I left a few up, but eliminated multiple traps in the same location. When I got to the last trap, I noticed something was wrong right away. From a distance, I could see that the trap was pulling away from the support board on the side. This thing was about to fall off the tree! When I got close enough to see the entrance, the reason became clear. There were about a hundred bees on the front, and hundreds of bees coming and going. I had caught my first swarm! So, it is much too early for spring swarms here, meaning this swarm must have moved in during the October goldenrod bloom. I never checked the traps after August, and I learned my lesson. It is always great to catch a free swarm, however, this colony had been building in this swarm trap for months. This thing was so heavy, I struggled to get it down from the tree. When I peeked under the lid, the swarm trap was packed with natural comb, honey, and bees. 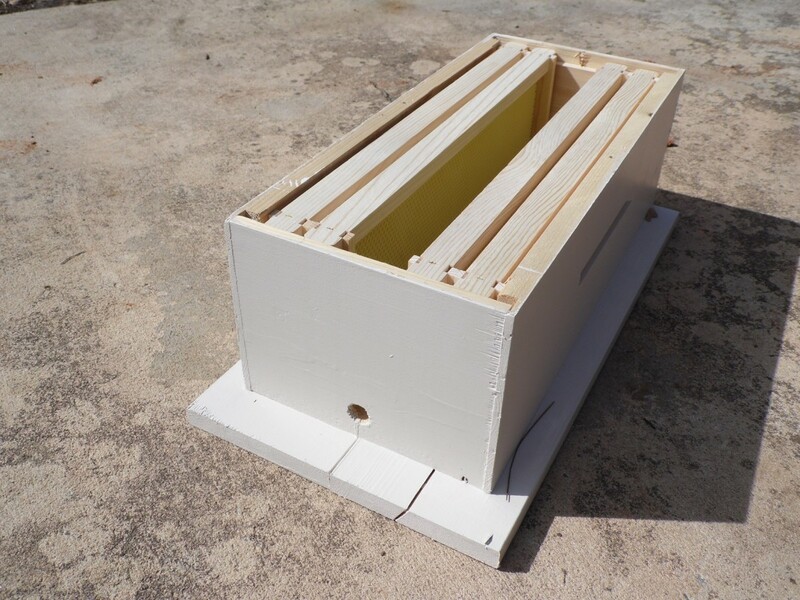 Check out the link below to watch me move the colony from the trap into a standard hive. Top bars of a beehive. Are You Trapping This Year? 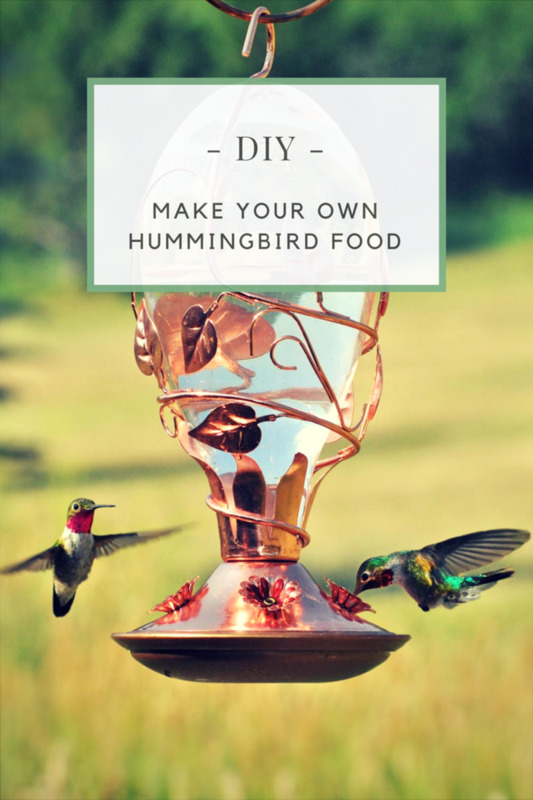 Will you attempt to trap a swarm of honey bees this year?